One of the challenges that you will encounter when setting up an Elvis 6 environment is finding out what hardware is needed. The best choice of storage, memory and processors depends on various factors. Note: Elvis Server will attempt to communicate this via https://activation.woodwing.net. How many users will be using the system at the same time? Will users frequently perform searches? How many files will be stored in Elvis? What type of files will be stored: images, videos, office documents, text files, ...? Will files be frequently imported (manually or automatically)? Will there be constant feeds of incoming material? Will there be high volume bursts of incoming material? Use your answers and the information in the following sections to find the hardware required for your environment. Original assets. The required disk space for storing the original assets depends on their type and their size: text files and XML files will obviously take up far less space than images and videos. Index. The required disk space for storing the index depends on the type of assets that are stored: text files, office documents and PDFs are fully indexed and will therefore increase the size of the index. For images and videos only the metadata is indexed which results in a lesser impact on the index size. Previews. Previews in Elvis are typically light-weight but can take up disk space for certain file types such as PDF files and videos (for which the first few minutes are stored as the preview). File versions. When files are edited and subsequently checked-in, a new version of the file is generated which can be restored as the main version when needed. This typically takes place for images, layouts and Word documents. Depending on the number and type of assets for which versions are created, additional storage is required. The original assets, previews and search index are stored in a file system. In a small environment, this can be put on a local disk. Place the index (stored in the Elvis Hot Data folder) on fast storage when many searches are performed by the users. Typically you would use 10000 RPM or 15000 RPM SAS or SCSI disks, or even SSD disks. Because the index is usually only a few gigabytes in size, this disk does not need a lot of storage capacity. Store high numbers of original assets, previews and file versions on large disks or a SAN (Storage Area Network). If you expect that number to grow, use a volume that is expandable such as a SAN solution that allows extra disks to be added to an existing volume. For stability and performance reasons we advice to use a SAN or a NAS (Network Attached Storage) that supports iSCSI or Fiber. When a Fibre channel is possible, use it to increase performance; network shares based on file-level protocols such as SMB/CIFS, AFP or NFS can be unstable or slow. The main File Store that contains the original assets cannot be partitioned over multiple disk volumes; spreading data over disks should be handled by the SAN or RAID. For best performance, make sure that all File Stores (assetFilestore, renditionFilestore and tempFilestore) are on the same volume. This way, files are moved instead of copied (the process of copying a file is very slow). Note: When Elvis Server acts as a Search node, 8 GB of memory is the absolute minimum. The number of CPU cores needed depends mostly on the number of users that are actively using Elvis Server. The following hardware configurations have proven reliable in performance. Mac mini. A Mac mini with a dual-core Intel Core and 8GB of memory is an excellent configuration for a small number of users with a fair amount of assets and a low daily intake of new assets. It is a simple machine to install with Mac OS X client or Mac OS X Server (in case you want to run an LDAP service). The hardware can be configured with 1 or 2 hard disks (OS X server version only), possibly in a RAID configuration and/or using an external hard disk for storage. Mac Pro. A Mac Pro with a Quad-Core Intel Xeon processor and 8–16GB of memory is very suitable for a small to average number of users with many assets and a low daily intake of new assets. The extra number of cores and processors makes this a much more powerful configuration than the Mac mini. Because of the multiple hard disk bays it is also possible to set up a RAID or SoftRAID configuration or use SSD storage for storing the index for exceptional search performance. Optionally, SAN solutions can dramatically expand the storage capacity if needed. By adding extra Mac minis or Mac Pros as Elvis Processing nodes it is very easy to expand processing power to handle more assets, thereby allowing the Search node to handle more users. Windows system. A Windows Server with a Quad-Core Intel Xeon processor (or faster) and 16–32GB of memory is very suitable for a small to average number of users and a high number of assets with an average daily intake of new assets. Advised are machines with multiple hard disk bays so that it is possible to set up a RAID or SoftRAID configuration. This also offers the option to use SSD storage for storing the index for exceptional search performance. Optionally, SAN solutions can dramatically expand the storage capacity if needed. When content is added to the system, Elvis Server generates thumbnails and previews, and extracts text and metadata. Processing these tasks requires a lot of CPU power and memory. Performance can be considerably improved by setting up one or more dedicated Processing nodes. Figure: A typical cluster consisting of 3 Search nodes and 2 Processing nodes. For more information, see The Elvis 6 structure: clusters and nodes. We advise to connect the Search nodes and the Processing nodes to the same physical switch and in the same network subnet. If there are too many network switches or routers in between, the connection might become unstable and performance will degrade because of the large amounts of data that is sent back and forth. How many processing capacity you need depends mostly on how many files are imported per day and how heavy those files are to process. For example, if you have a number of wire feeds being imported by scheduled folder-import modules, you may need additional Processing nodes. Video files and high-res material can take longer to process, so if you expect heavy material to be imported on a regular base, use more or heavier Processing nodes. Since you can use a cluster of multiple Processing nodes, it makes sense to use at least two or more (a typical cluster consists of 3 Search nodes and 2 Processing nodes). Doing so provides not only increased processing power, but also provides automatic redundancy when one of the processing machines fails. 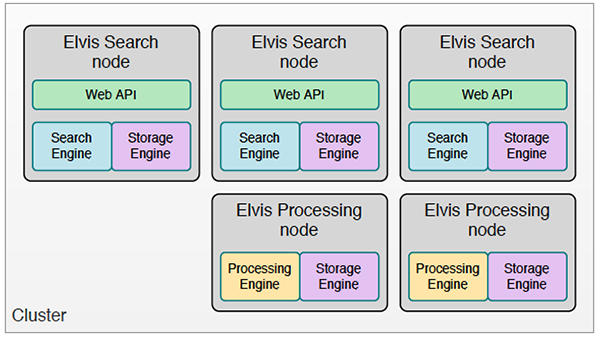 Elvis will detect a processing node that is no longer responding and will redirect any processing requests to the remaining machines in the cluster. You can build a cluster of about 3 Mac mini's for the same price as one Mac Pro. In some cases this can result in higher total throughput. Be aware though that each individual file will take longer to process. When using Mac mini's you will typically use at least two or more of them. You do not necessarily need the 'server' version of the Mac mini. A simple desktop model will do: no RAID configuration is required and redundancy is already provided because you are using more than one Processing node. The advantage of a server model is that its CPU is faster and the hard drives are faster (when configured as a maximum performance RAID set). Very suitable when many files are imported into Elvis and previews need to be available as fast as possible. Although they require more rack-space than Mac mini's, these machines are very powerful. You will need quite a few Mac mini's to get the same capacity as one or two Mac Pros.